The Kentucky Derby is a Grade I stakes race for three-year-old Thoroughbreds, held annually in Louisville, Kentucky, on the first Saturday in May, capping the two-week-long Kentucky Derby Festival. The race is one and a quarter miles at Churchill Downs. The race is known in the United States as "The Most Exciting Two Minutes In Sports" or "The Fastest Two Minutes in Sports" for its approximate duration, and is also called "The Run for the Roses" for the blanket of roses draped over the winner. It is the first leg of the US Triple Crown The Kentucky Derby has been run every consecutive year since 1875. 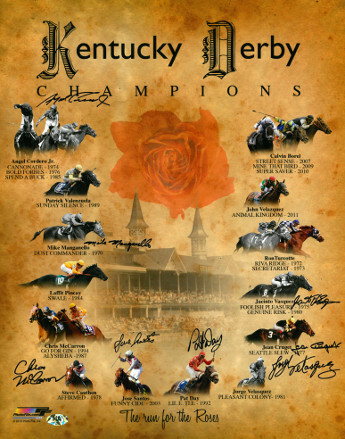 This Churchill Downs Kentucky Derby Rose 16x20 Photo has been signed by 12 Past Winners (8 Jockeys). Angel Cordero - 1974 Cannonade, 1976 Bold Forbes, 1985 Spend The Buck; Mike Manganello - 1970 Dust Commander; Chris McCarron - 1994 Go For Gin, 1987 Alysheba; Jose Santos - 2003 Funny Cide; Pat Day - 1992 Lil E Tee; Jorge Velasquez - 1981 Pleasant Colony; Jean Cruguet - 1977 Seattle Slew; Jacinto Vasquez - 1975 Foolish Pleasure, 1980 Genuine Risk; MAB Hologram and Certificate of Authenticity from Athlon Sports.